Successfully Added Wireless 802.11N USB Adapter - Hi-Speed WiFi Internet Connection to your Shopping Cart. 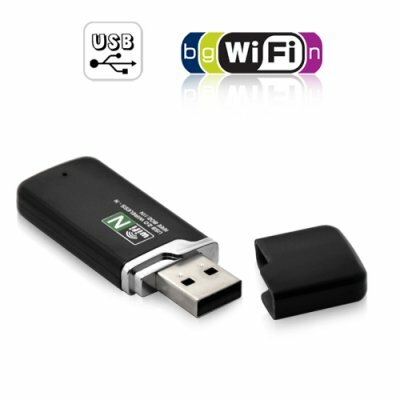 Wireless 802.11N USB adapter for connecting at the next generation of Wifi internet speed, a blazing 300Mbps! Wifi USB wireless internet adapter utilizing the new 802.11N wireless standard for a transfer rate up to 300Mbps. This Wifi USB adapter will provide you with the connection speed necessary for media streaming and productivity improvements while working via the internet. Bring the astonishing speed and amazing range to your computer that is available only with the new 802.11N wireless standard. Be able to connect to the internet wherever there is a WiFi Hotspot or Access Point, in ranges and speeds you have never seen before, all with this new USB WiFi 802.11N dongle. Now you can have the fastest available wireless internet connection without the need for buying a new computer or going through the hassle and expense of trying to upgrade your existing computer. Just install the intuitive software, plug the dongle into a USB port and you're ready to connect! This model can connect via the new 802.11N wireless standard as well as the older 802.11G/802.11B standards. Get this Wifi USB adapter now and see your desktop, netbook or laptop computer connecting to the internet at the fastest speed possible! The 802.11N High Speed Wireless USB Adapter is in stock now and available for single piece and bulk orders. Click "Add to Cart" now and we'll express ship you out a sample within 24-hours! Brought to you from the leaders in China factory direct wholesale electronics - Chinavasion. This convenient Wireless USB Adapter provides you with the fastest available wireless internet connection without the need to buy a new computer or go through the hassle and expense of trying to upgrade your existing computer. Simply install the software, plug in the Wireless USB Adapter, and you gain instant access to any 802.11 N/G/B wireless network. Will this 802.11N wireless internet adapter work when I am in Starbucks, the airport or other public WiFi hotspots? Yes, this will connect to any wireless network at the maximum speed available on the network. Many public wifi hotspots are currently only 802.11G, in which case your speed will be limited to 54Mbps. How does the wireless 802.11N USB adapter exactly work? easy to use. for old computers most essential gadget.if it comes with gsm sim slot it will become incomparable gadget in that range. I give it 4 stars cos of the cap.